Ahead of the greatly anticipated release of the Hollywood blockbuster, Star Wars: The Last Jedi, Nissan has collaborated with the franchise to fittingly unveil six themed vehicles at the 2017 LA auto show. Showcasing the expressive designs of some of the brand's most popular models, each one has been developed by an artist from Lucasfilms to feature a dramatic display, including many of the fan's most favourite characters and crafts. These include hydro-dipped graphics, surround sound equipment and aged exterior colouring and textures in order to simulate the appearance of use in space battles. "We’re back this year, collaborating with Lucasfilm and the artists at Industrial Light & Magic to create these amazing concept vehicles across some of our best-selling models," said Jeremy Tucker, vice president, marketing communications & media, Nissan North America, Inc. "These show vehicles were created for our fans, and will be unveiled at the Los Angeles auto show and shared across the country in regional auto shows over the next several months." The 2018 Nissan Maxima has been infiltrated by the dark side, transforming into Kylo Ren's TIE silencer. Sharing similar super speed and astute handling characteristics, the themed vehicle is said to be customized to the evil Jedi's deadly specifications, featuring laser cannons and missile launchers aside its distinctive wings. The car's grille is ever more distinguishable in this fan fantasy as crimson lighting illuminates the shape just like Kylo Ren's lightsaber. The Maxima's aggressive exterior styling bolstered into a truly sinister sedan. Kylo Ren’s black and silver facemask has been integrated as milled aluminium into the car’s body. Other details, such as the front lower spoiler and hood, are complemented with dramatic glimmers of his red lightsaber. Shown at the 2017 LA auto show, the 2018 Nissan Altima adorns the first order’s uniform as it becomes a special forces TIE fighter. The brand’s best selling sedan enhances custom body features, such as the cockpit window, to fit the evil empire’s fleet. Furthermore, it includes custom wheels and full body wrap to seemingly place the car in a galaxy far, far away. 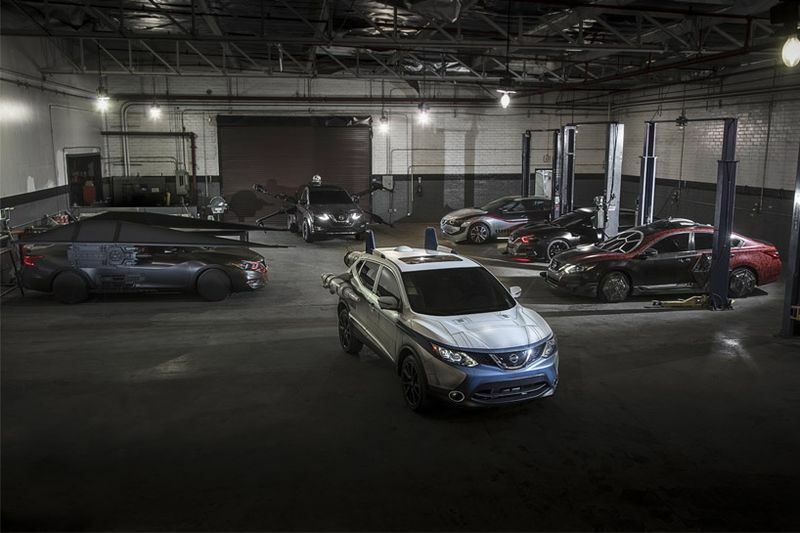 Turning to the light, a 2018 Nissan Rogue leads the new republic Starfleet as Poe Dameron's X-wing, equipped with the famed BB-8 robot. With massive fixed wings, the starfighter vehicle boasts a pair of illuminating thrusters, as well as quad laser cannons. Atop the car sits the droid, which only functions with lights, motion and sound, instead of its guidance, communication systems and engineering abilities, as seen in the films. It is not world changing or highbrow stuff, but it is a good promotional marketing campaign. Take a look through the gallery for a bunch of photos.